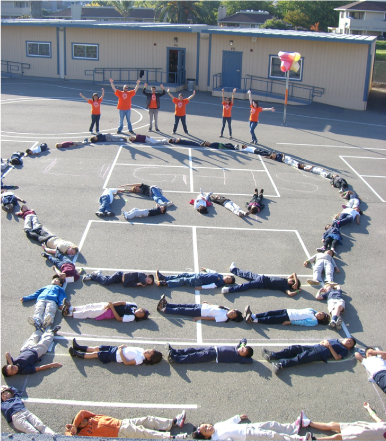 Kids form a human lightbulb to celebrate "Lights on Afterschool." Afterschool programs across the country celebrated the 19th annual Lights On Afterschool, a national rally to underscore the importance of afterschool programs. Linda Barton, director of the Wyoming Afterschool Alliance, said the impact of afterschool programs is multifaceted. They provide a safe space for kids while parents are still at work, they help reduce both delinquency and victimization, and they offer unique learning opportunities. "It's also an opportunity for 15 hours of extra time that kids can spend inventing, becoming young entrepreneurs, also developing their critical thinking and teamwork skills," said Barton. "And all of the skill areas that businesses are really looking for." Barton said kids in Wyoming's afterschool programs get to explore being inventors, entrepreneurs, and community leaders. She said that makes afterschool programs an important part of preparing kids for a future of work in a changing economy. "We feel that afterschool is a great opportunity to offer those expanded opportunities that are hard to implement during the school day." In Wyoming, Barton said there are 15 different programs participating in Lights On Afterschool from Cheyenne to Dubois. Nationally organizers predicted over one million participants will attend more than 8,000 events. Across the nation, kids are getting caught up in the juvenile justice system more than they should be. That’s according to advocates who say more could be done to intervene before law enforcement get involved. In Albany County alone, there are over 700 incidents involving juvenile offenders every year. But Peggy Trent, the county’s prosecuting attorney, said at least 70 percent of those cases could be handled by schools. President Trump’s budget proposal calls for the elimination of the 21st Century Community Learning Centers program, which would save $1.2 billion. But across the country, this program is a primary source of support for after-school and summer programs that serve students in low-income communities. There are over 50 programs in Wyoming that would be affected. Wyoming Public Radio’s Education Reporter Tennessee Watson spoke with Linda Barton, director of the Wyoming Afterschool Alliance about why summer camp matters.